Peter Cohan teaches strategy and entrepreneurship to undergraduate and MBA students including courses such as Strategic Problem Solving and Strategic Decision Making. He also developed and teaches Foundations of Entrepreneurial Management for undergraduate transfer students. Since May 2002, Cohan has served as an executive-in-residence at Babson, advising teams in their consulting work with companies through Management Consulting Field Experience (MCFE) programs. He created and led the Hong Kong/Singapore Start-up Strategy Offshore elective for MBA students and teaches the Strategy and the CEO capstone in the evening MBA program. For undergraduates, he created and runs the Paris, Israel and Portugal/Spain Start-up Strategy Offshore electives. He has also served as a visiting professor at Barcelona’s EADA. Cohan began his career at Index Systems, a management consulting firm founded by several MIT professors. While there he worked with James A. Champy, co-author (with former MIT professor, Michael Hammer) of Reengineering the Corporation (HarperBusiness, 1993). Following business school, Cohan worked at The Monitor Company, a strategy consulting firm co-founded by Harvard Business School professor Michael E. Porter. Cohan then worked in strategic planning at Bank of Boston and in the Finance Department of Liberty Mutual. In 1994, Cohan started Peter S. Cohan & Associates, a management consulting and venture capital firm. His management consulting unit helps managers with strategy, best practices, operational improvement, and litigation support. Since 1981, Cohan has completed over 100 consulting projects. 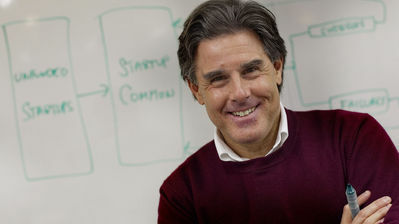 His venture capital business has invested in seven companies including Andromedia, an Internet software company, which Macromedia purchased in 1999 for $440 million; SupplierMarket.com, an online marketplace for industrial supplies, which Ariba purchased in 2000 for $930 million; and Lexar Media, a digital media company that was sold in 2006 to Micron Technology (MU) for $690 million. In December 2014, he invested in Social Finance, a peer-to-peer lending company in San Francisco. Cohan has authored 13 books and contributed to six management compendiums. His most recent book is Startup Cities: Why Only a Few Cities Dominate the Global Startup Scene and What the Rest Should Do About It (Apress, February 2018). Prior to that he authored Disciplined Growth Strategies: Insights from the Growth Trajectories of Successful and Unsuccessful Companies (Apress, February 2017) and Hungry Start-Up Strategy: Creating New Ventures with Limited Resources and Unlimited Vision (Berrett-Koehler, November 2012). His other books include Export Now: Five Keys to Entering New Markets (Wiley, September 2011) co-authored with Frank Lavin; Capital Rising: How Capital Flows Are Changing Business Systems All Over the World (Palgrave-Macmillan, June 2010) co-authored with U. Srinivasa Rangan; You Can’t Order Change: Lessons from Jim McNerney’s Turnaround at Boeing (Portfolio, 2009); Value Leadership: The Seven Principles That Drive Corporate Value in Any Economy (Jossey-Bass, 2003); e-Stocks: Finding the Hidden Blue Chips Among the Internet Impostors (HarperBusiness, 2001); e-Profit: High Payoff Strategies for Capturing the E-Commerce Edge (AMACOM, 2000); Net Profit: How to Invest and Compete in the Real World of Internet Business (Jossey-Bass, 1999); and The Technology Leaders: How America’s Most Profitable High Tech Companies Innovate Their Way to Success (Jossey-Bass, 1997). Cohan has published articles in Business Strategy Review and Knowledge@Wharton<mailto:Knowledge@Wharton>; he writes four columns: Forbes Startup Economy, Inc, The Hungry Start-Up, Wharton Blog Network, and the Worcester Telegram & Gazette’s Wall and Main. With Babson Professor Sam Hariharan, Cohan has co-authored three published cases: Growing Pains at Commonwealth Dairy (2016), Chokehold on Live Entertainment (2010) and Warren Buffett and His Newspaper Investments (2014). Cohan is a frequent commentator on developments in economics, technology, and finance. He has been a guest on ABC’s Good Morning America, CNN, CNBC, PBS’s Wall $treet Week, and New England Cable News (NECN). He has been quoted in the New York Times, the Wall Street Journal, the Washington Post, Barron’s, Red Herring, Time, Business Week, Fortune, and Newsweek International. He has spoken at Stanford University’s Forum for American/Chinese Exchange (FACES) and taught in its Industry Thought Leaders program, Columbia University’s Senior Executive Program, the University of Hong Kong, and other universities in Europe and Asia. He has also conducted management development programs in the US and Asia sponsored by leading corporations, such as IBM, Intel, Hewlett Packard, Oracle, Fidelity Investments, and Procter & Gamble. Cohan also appeared in the 2016 movie, We the People: The Market Basket Effect. Cohan, P.S. (2009). Helping your people get 15 percent better. Leader to Leader. Cohan, P.S. (2008). Riding the Value Cycle. Business Strategy Review. Cohan, P.S. (2008). Value leadership: the principles driving corporate value. Business Strategy Review. Cohan, P.S., Rangan, U.S. (2007). Follow the Legend: Seven Strategy Lessons from Entrepreneurs. Business Strategy Review. Vol: 17, Issue: 4, Page: 56-61. Blackwell Publishing. Cohan, P.S. (2007). When the blind lead. Business Strategy Review. Cohan, P.S., Unger, B. (2006). Four sources of advantage. Business Strategy Review. Cohan, P.S. (2018). Startup Cities: Why Only a Few Cities Dominate the Global Startup Scene and What the Rest Should Do About It. Apress. Cohan, P.S. (2017). Disciplined Growth Strategies: Insights from the Growth Trajectories of Successful and Unsuccessful Companies . Apress. Cohan, P.S. (2012). Hungry Start-up Strategy: Creating New Ventures with Limited Resources and Unlimited Vision: BK Business Series. Page: 256. Berrett-Koehler Publishers. Cohan, P.S., Lavin, F. (2011). Export Now . Wiley. Cohan, P.S., Rangan, U.s. (2010). Capital Rising. Palgrave Macmillan. Cohan, P.S. (2008). You Can’t Order Change. Penguin Publishing Group. Cohan, P.S. (2003). Value Leadership. Wiley. Cohan, P.S. (2002). E-Leaders. Capstone. Cohan, P.S. (2002). Technology Leaders. Capstone. Cohan, P.S. (2001). e-Stocks. Harper Business. Cohan, P.S. (2001). Net Profit. Jossey-Bass. Cohan, P.S. (2000). e-Profit. AMACOM. Cohan, P.S. (1997). The Technology Leaders. Jossey-Bass. Hariharan, S., Cohan, P.S. (2016). Growing Pains at Commonwealth Dairy: Growing Pains at Commonwealth Dairy. Page: 17. Babson College. Hariharan, S., Cohan, P.S. (2016). Growing Pains at Commonwealth Dairy - Teaching Note: Growing Pains at Commonwealth Dairy. Page: 17. Babson College. Cohan, P.S., Hariharan, S. (2014). Warren Buffett and his Newspaper Investments. Babson College. Cohan, P.S., Hariharan, S. (2014). Warren Buffett and his Newspaper Investments - Instructor Spreadsheet. Babson College. Cohan, P.S., Hariharan, S. (2014). Warren Buffett and his Newspaper Investments - Teaching Note. Babson College. Cohan, P.S. (2002). Business: The Ultimate Resource. Basic Books. Hariharan, S., Cohan, P.S. (2010). Chokehold on Live Entertainment (B). Vol: 89-C-10-B. Babson College . Hariharan, S., Cohan, P.S. (2010). Chokehold on Live Entertainment (A). Vol: 89-T-10-A. Babson College .